TradePlus offers $50 free bonus for all new clients. If you want to start trading binary options, this is good chance to try your trading skills, because when you make your first deposit, you will receive $50 free, so your trading equity will be good. The first step is always important, so grab your bonus to make more money with TradePlus. TradePlus is binary options broker licensed in the Republic of Vanuatu and regulated by VFSC (Vanuatu Financial Services Commission) as VNCM Limited, license # 300352. With this binary options broker you can trade short term, and short term spread options, in expiry increments of 30 seconds, 60 seconds, 120 seconds, 3 minutes, and 5 minutes. Other option types available are the High/Low, and Spread High/Low options, which have returns of 100%. The minimum trade size is $10, as the minimum deposit is $50 for a new account. You need to open free new account and you should upload verification documents. 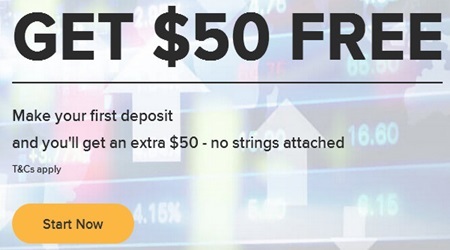 After approval, you must deposit as little as $50 and after that you will receive $50 free bonus in your trading account. This promotion may not be valid for some countries, please ask their support for more information. All profits could be withdraw, but the withdrawals must be performed only through the same bank account or credit/debit card that you used to deposit the funds. Withdrawals will take 3 to 5 business days to process. Traders could not withdraw the $50 free bonus. The Promotion is only open for people aged 18 or over! The company may cancel the bonus at any time.